I can’t count the number of times we get asked if we would add a vendor to our preferred vendor list. The truth of the matter is that we don’t have a preferred vendor list. 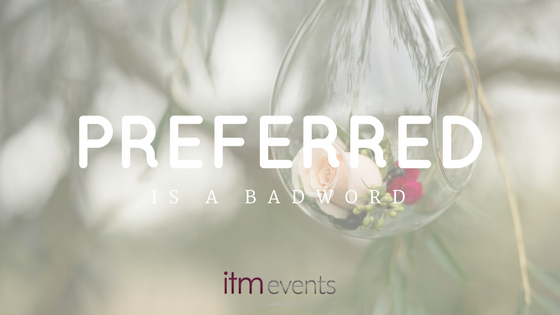 You may have noticed that on our website we don’t have a preferred vendor list and the reason for that is simple, in our opinion, it is not good business for an event planner to have preferred vendors. Of course we all have vendors we really enjoy working with however the client’s needs must always come first. To us this means researching and recommending our top 3 to 4 options in each service provider category based on our client’s needs. We provide the recommendations with pros and cons, price points and we sit down and have an educated conversation with our clients and help them choose the best offering for them. This not only provides the best options for our clients but it also provides equal opportunity for many business to sell what they do best, whether they are a seasoned 25+ year veteran or a brand new small business. 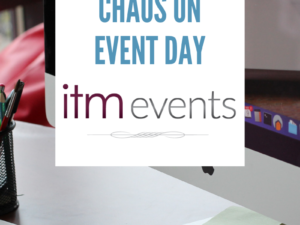 Each Event is Unique: We always want the best services and products for our clients, regardless of geographical location, time of year, venue space, number of people, target audience, and type of event. 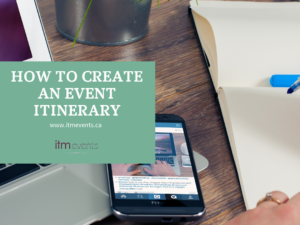 Being full service event planners means that we work with a number different clients in different markets, for example: social, corporate, fundraising, personal. Their unique needs will always come first to get them exactly what they want and need to provide the best experience for them and their guests/attendees. Priority: What is the goal of the event, a wedding is very different from an educational conference. 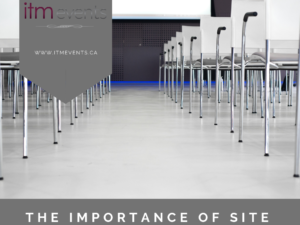 We have to work with each client’s unique return on investment for their event. Here is an example, if a specific menu is very important to the client we are working with, then it is best to find a caterer that specializes in the type of food they want to serve, the best, not just picking a caterer we have a great relationship with that can pull off a specialized menu if we ask them. Perhaps the priority of a wedding client is a pretty, air conditioned venue space. 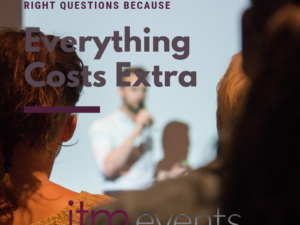 We would certainly then provide recommendations that fit that category and not try to sell them on a venue that doesn’t really meet their needs just because we have a great working relationship with them. Budget: This is one of the most important factors. Every client is different when it comes to their outlined budget. We have to work with them to negotiate and compromise to get all their preferences. So we may use a less expensive option in event photography for example, to splurge on the high end venue they need to host their event in. Location: We frequently work all over Eastern and South Eastern Ontario, even sometimes Canada wide or internationally. So not all vendors are prepared to offer services in Vancouver versus Ottawa. In order to avoid transportation and delivery costs, we will adjust our recommendations to provide valuable options in that geographical area. Now of course all these reasons overlap to offer and deliver the best services and products to our clients. It requires a balance and in our opinion if we only work with preferred vendors then not only are we limiting the options to our clients we are limiting the endless opportunities for all the amazing, potentially not as well known professionals who would love the opportunity to provide top of the line service to our clients. If you are looking for an event planner who will go out of their way to provide you with the best options for your event, based on your specific needs, then you’ve come to the right place!